Locations in Charleston, Sc. When your clients are looking for engagement photos, they generally will almost always choose to be photographed in the city downtown, also known as the historic district. Here you have the market area located between Meeting and Market or East Bay and Market, another popular location is Broad Street, as well as The Battery where all of the Charleston homes overlook Fort Sumter. 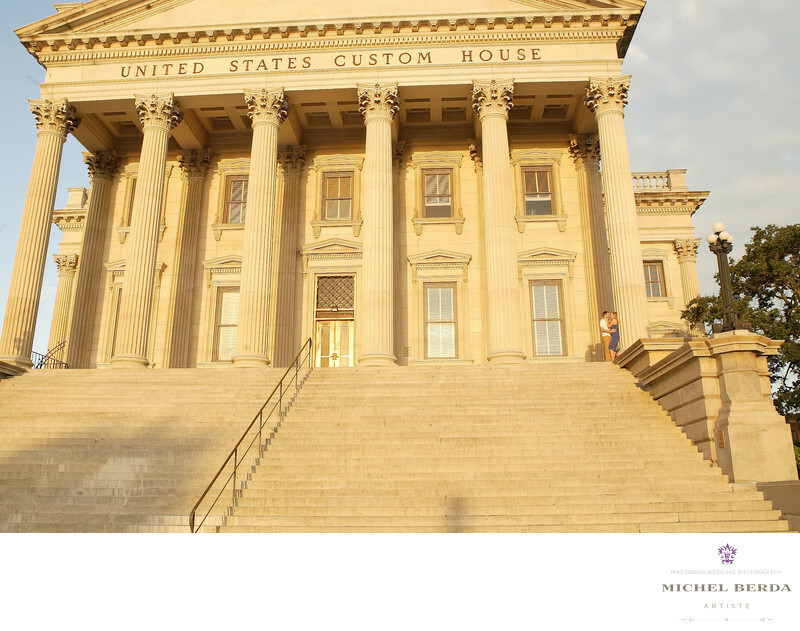 There are many other choices as well to many to list , but one of my favorite spot to start a engagement session in Charleston is The Custom House, this building is exquisite, the columns do it for me, it takes me back to Greece, the tile checkered floors, the steps, a beautiful historic building, with rich history. The building is so massive as you can see in this image that the clients are very small to the right of my lens, the color from the sun give this images such a golden glow to it, all of the lines from the stairs to the railing, columns, and the top of the building are pure great architecture. This images represent this great Holy City and so much that it has to offer.Keywords: architecture (3), Charleston (1179), Engagement Photos (6), Historic City (3), sc (309), The Custom House (6).